The FAA has updated its policies for filing alternate airports for pilots who use an IFR-approved GPS. According to the new policy, which will added to future versions of the AIM, advisory circulars, and other documents, pilots with non-WAAS GPS navigators can now file an alternate airport that is served only by GPS-based instrument approaches, provided the original destination airport has ground-based procedures, or vice-versa. Pilots flying WAAS-equipped aircraft with baro-VNAV capability (typically only business jets and airliners) can now use the LNAV/VNAV decision altitude for applicable alternate airport weather minimums. Pilots without baro-aided LNAV/VNAV capability must still meet the requirements of 14 CFR § 91.169, which specifies alternate airport weather minima for non-precision approach procedures. In other words, at the estimated time of arrival at the alternate airport, the forecast weather at the alternate must call for a ceiling of at least 800 feet and visibility of at least 2 statute miles. 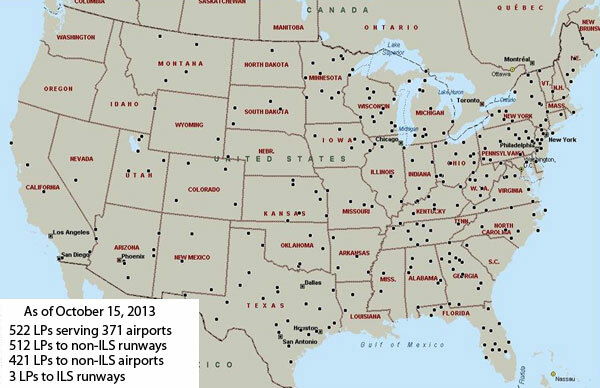 The FAA [has] also studied the availability of GPS and Wide Area Augmentation System (WAAS) for GPS­ and WAAS-based instrument approaches at destination and alternate airports. As a result, the FAA has updated the policy and provided clarification to enable additional flexibility for users while maintaining safety in the National Airspace System (NAS). The current alternate airport planning policy allows users equipped with non-WAAS navigators…to plan for GPS-based instrument approach procedures (IAP) at their destination but not at their alternate airport. 3. 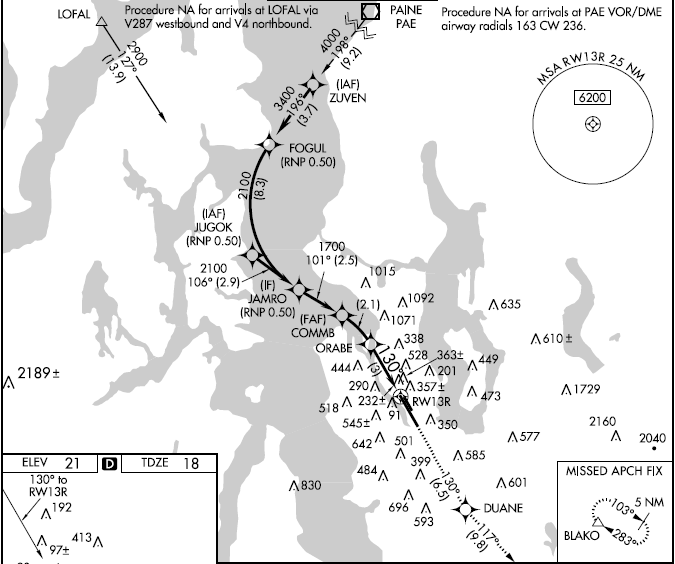 RNP 0.3 DA on an RNAV (RNP) IAP if specifically authorized with approved baro-VNAV equipment. …The FAA based this policy clarification on the facts that GPS-based lateral guidance is the same for LNAV, LNAV/VNAV and RNP 0.3 DA and approved barometric vertical navigation equipment does not rely on GPS information. Therefore, a loss of GPS vertical would not affect these WAAS users navigating vertically with baro-VNAV. The current alternate airport planning policy explicitly prohibits TSO-C145() and TSO-C146() equipped users (WAAS users) from planning to use WAAS vertical guidance at their alternate airport. 1. LNAV/VNAV DA at an alternate airport. 2. 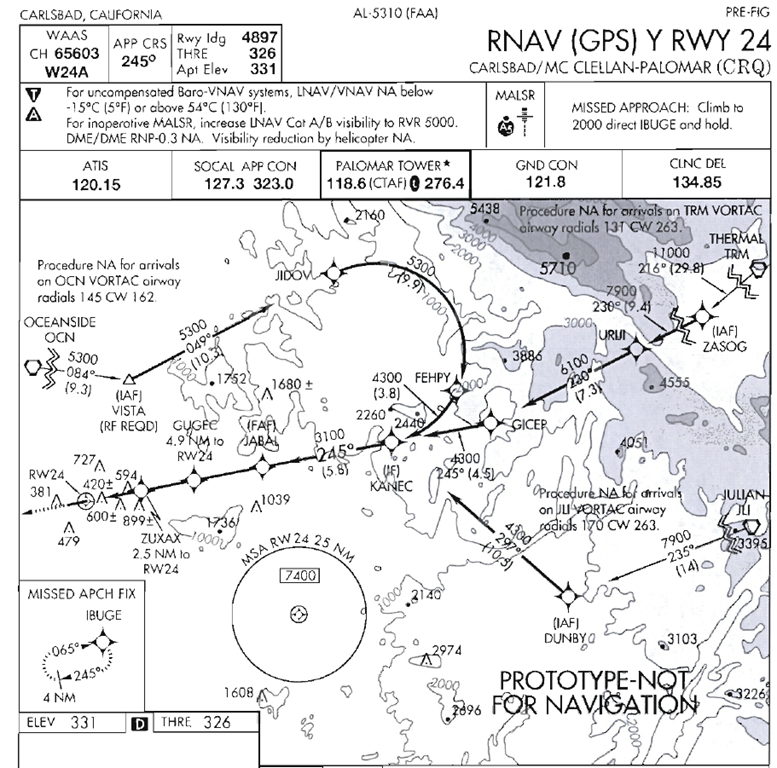 RNP 0.3 DA on an RNAV (RNP) IAP at the alternate airport if specifically authorized. The FAA based this policy clarification on the facts that GPS-based lateral guidance is the same for LNAV, LNAV/VNAV and RNP 0.3 DA and approved barometric vertical navigation equipment does not rely on GPS information. Therefore, a loss of GPS vertical would not affect these WAAS users navigating vertically with baro-VNAV. The agency intends to publish another 2,500 procedures by 2016, which will allow every runway in the nation that qualifies for an LPV to have one. The latest data available from FAA, as of September 20, 2012, show the total number of approaches with LPV minimums has reached 2,989. By comparison, there were 1,281 category 1 ILS approaches in the inventory as of that date. More than 50 percent of the so-called LPV approaches serve airports that have no approaches that rely on ground-based navigation aids (i.e., ILS, localizer, VOR, or NDB). LPV procedures truly are expanding the options for instrument-rated pilots who fly aircraft equipped with IFR-approved, WAAS-capable GPS navigators. LPV approaches can serve runways that may not meet the requirements for an ILS–indeed, many of those runways are suitable only for small general aviation aircraft. To learn about some of the criteria, see Table A16-1B Airport Infrastructure (from AC 150/5300) below. For example, the minimum runway length for an LPV approach is 3200 feet; the comparable number for an ILS is 4200 feet. 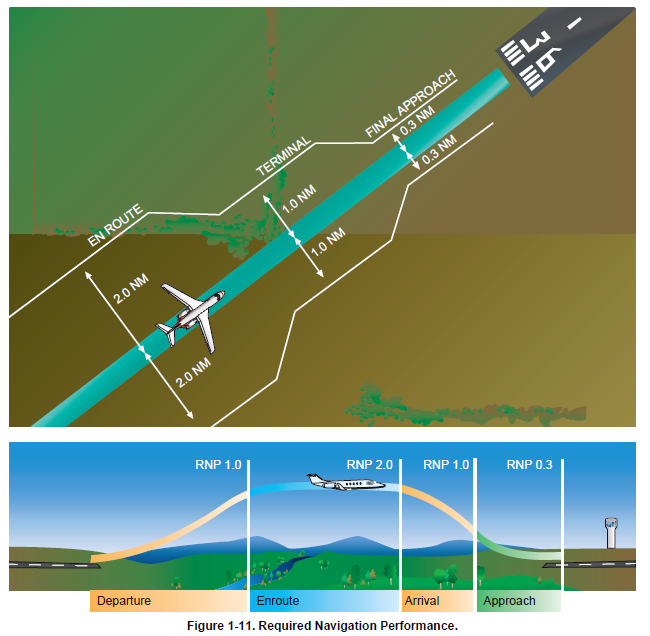 Now, the minimums for an LPV approach to a 3200-ft runway are at least 1 statute mile visibility and a DA of 350-400 feet. If an LPV procedure is to match the best minimums for a typical ILS (1/2 statute mile visibility and a DA of 200 feet), the LPV procedure must be to a runway that meets criteria for a conventional precision approach, including runway length, lighting, parallel taxiways, and markings. 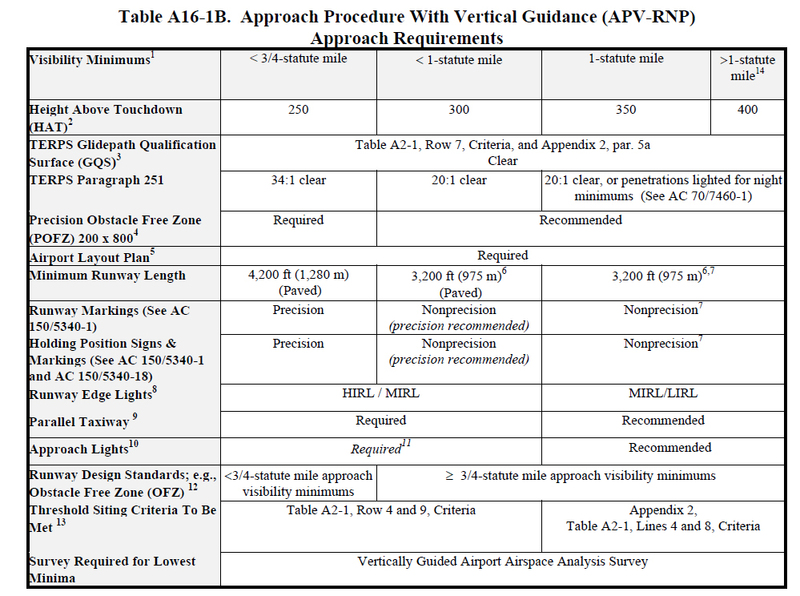 Approach Procedure with Vertical Guidance (APV). Runways classified as APV are designed to handle instrument approach operations where the navigation system provides vertical guidance down to 250 feet HATh and visibilities to as low as 3/4 statute mile. May apply to the following approach types: Instrument Landing System (ILS), LNAV/ Vertical Navigation (VNAV), Localizer Performance with Vertical Guidance (LPV), or Area Navigation (RNAV)/Required Navigation Performance (RNP). These runways must be at least 3,200 feet (975 m) in length with a width at least 60 feet (18.5 m) (with 75 or 100 feet [23 or 30 m]. Of course, an LPV procedure is essentially just data in a GPS navigator. To establish an LPV procedures, the owners of an airport don’t have to invest in or maintain ILS transmitters. Once the FAA has the required obstacle surveys and gathered related information, publishing LPV procedures to both ends of an eligible runway (indeed, to the ends of all eligible runways at an airport) requires little incremental investment (for example, to cover the costs of designing and flight-testing each additional procedure). That’s the main reason that the FAA can publish so many new LPV procedures and plan to meet the goal, in four years, of making LPV approaches available to all eligible runways. I often get questions about how and when a pilot can substitute a GPS receiver/navigator for ground-based navigation aids when flying under IFR. Fortunately, the latest update to the AIM (dated 25 August 2011) included revisions to section 1-2-3: Use of Suitable Area Navigation (RNAV) Systems on Conventional Procedures and Routes, specifically to clarify the use of RNAV systems (especially IFR-approved GPS units) as substitutes for ground-based navaids. Use of IFR GPS on Conventional Approaches and Use of GPS on Conventional Approaches (Update) at BruceAir. And for additional suggestions, see Setting the CDI on a Conventional Approach (The “Kill Switch”). 2. An RNAV system with DME/DME/IRU inputs that is compliant with the equipment provisions of AC 90-100A, U.S. Terminal and En Route Area Navigation (RNAV) Operations, for RNAV routes. A table of compliant equipment is available [here] (Microsoft Excel worksheet. That worksheet lists details about the specific capabilities of various units (subject, of course, to any limitations in the AFM supplement for your aircraft). For most GA pilots, only item 1 applies. “RNAV system with TSO-C129/ -C145/-C146 equipment…” basically means IFR-approved GPS units, either non-WAAS or WAAS-capable boxes. 1. Determine aircraft position relative to, or distance from a VOR (see NOTE 5 below), TACAN, NDB, compass locator, DME fix; or a named fix defined by a VOR radial, TACAN course, NDB bearing, or compass locator bearing intersecting a VOR or localizer course. 2. Navigate to or from a VOR, TACAN, NDB, or compass locator. 3. Hold over a VOR, TACAN, NDB, compass locator, or DME fix. 1. The allowances described in this section apply even when a facility is identified as required on a procedure (for example, “Note ADF required”). 2. These operations do not include lateral navigation on localizer-based courses (including localizer back-course guidance) without reference to raw localizer data. 3. Unless otherwise specified, a suitable RNAV system cannot be used for navigation on procedures that are identified as not authorized (“NA”) without exception by a NOTAM. For example, an operator may not use a RNAV system to navigate on a procedure affected by an expired or unsatisfactory flight inspection, or a procedure that is based upon a recently decommissioned NAVAID. 4. Pilots may not substitute for the NAVAID (for example, a VOR or NDB) providing lateral guidance for the final approach segment. This restriction does not refer to instrument approach procedures with “or GPS” in the title when using GPS or WAAS. These allowances do not apply to procedures that are identified as not authorized (NA) without exception by a NOTAM, as other conditions may still exist and result in a procedure not being available. For example, these allowances do not apply to a procedure associated with an expired or unsatisfactory flight inspection, or is based upon a recently decommissioned NAVAID. 5. 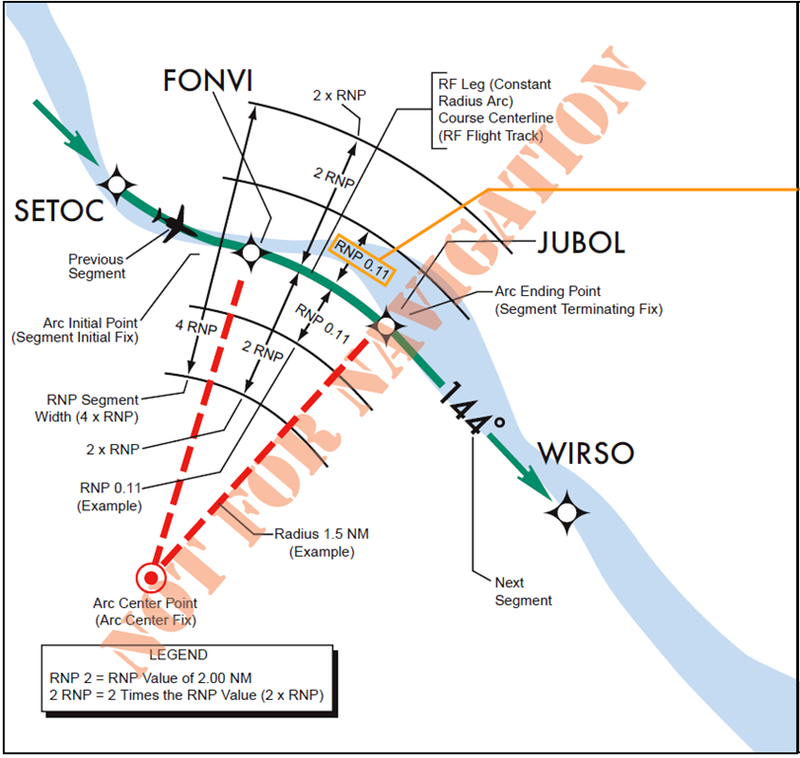 For the purpose of paragraph c, “VOR” includes VOR, VOR/DME, and VORTAC facilities and “compass locator” includes locator outer marker and locator middle marker. I also have links to several useful resources about GPS and WAAS on my Aviation Resources page.